for Bars, Restaurants and More! Blend’s algorithm is here to help you auto-create your schedule in less than 5 minutes. 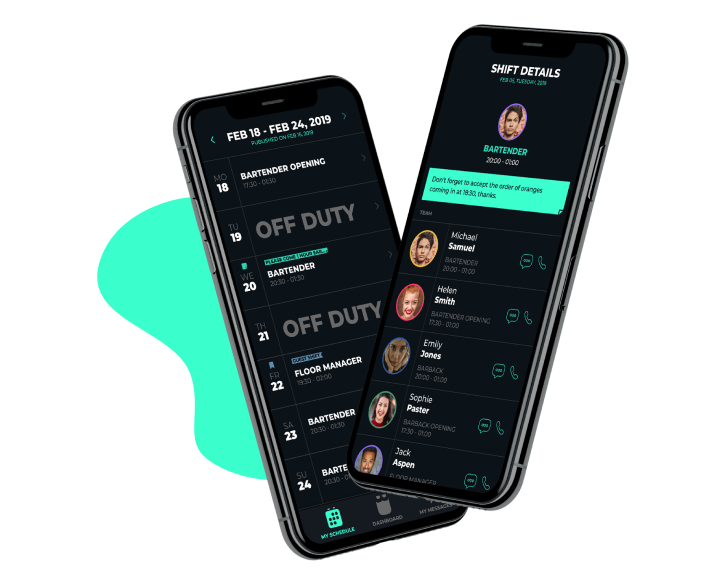 It analyses staffing requirements, roles, max/min working hours, approved vacation and previous shifts, to create a balanced and fair schedule for all. Team members can request time off through the app. Blend’s algorithm will take into account team availability and avoid scheduling conflicts. Recurring off-duty requests, never assign Dino on Wednesday, he has flaring classes! Handle unexpected changes without stress. Push notification and SMS are sent out as soon as a schedule is published. Making the weekly schedule available to the whole team at anytime, from anywhere. Get shift reminders, see who is working with you and any shift related notes. Everything gathered in one screen. Your next shift, who is working now and any shift note. The announcement section allows the manager to pin important messages that would otherwise be lost in a chat thread. Easily track weekly and monthly working hours and shifts, filtered by team member or role. Export into an excel file for greater payroll accuracy. No fear of loosing paper and excel files, everything is stored on cloud. Quickly print beautiful hard copies of your schedules, handy for posting at work. Quickly text employees through the app and auto create groups based on roles. Shares files and maintain open communication between employees. Simplify communication for your entire team - one to one, and group messaging.